By Scott Gilfoid: Eddie Hearn has reportedly offered Matchroom fighter Dillian Whyte (25-1, 18 KOs) £4million [$5.2 million] to challenge IBF/WBA/WBO heavyweight champion Anthony Joshua (22-0, 21 KOs) on April 13 at Wembley Stadium in London, England. Hearn isn’t sure whether Whyte will agree to the offer or not. He’s hoping he will, but it’s still too early to know. Hearn isn’t saying whether the $5.2 million will be his final offer to Whyte or if he’d be willing to sweeten the pot to get him over the finish line for April 13. It’s pretty clear that Whyte is the best fight for Joshua on April 13, given that Deontay Wilder and Tyson Fury will be facing each other in a rematch next. The $5 million Hearn is offering Whyte will be well below what Joshua will be getting. Some believe this translates to a 70-30 split in favor of Joshua. Whyte would be getting less than the 33% that former WBO heavyweight champion Joseph Parker received for his fight against Joshua last year, and below the 60-40 splits that have been offered to Deontay Wilder and Tyson Fury to face AJ on April 13. Whyte, 30, hasn’t entirely earned the right to fight Joshua. 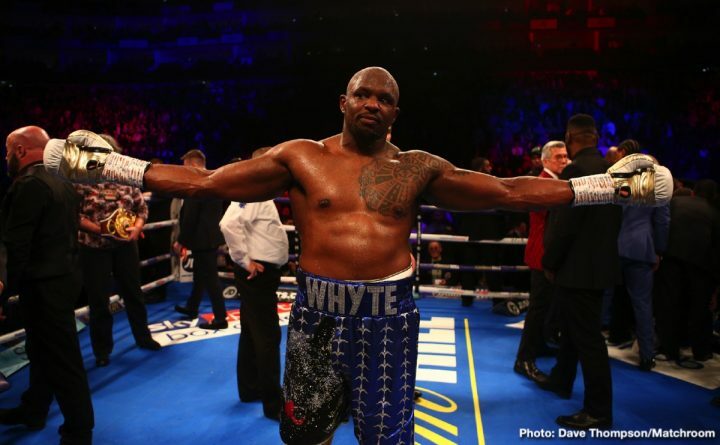 Whyte had a chance to earn a fight with Joshua when the World Boxing Council wanted him to fight Luis ‘King Kong’ Ortiz, but he didn’t want to take that fight. The WBC also wanted Whyte to fight Breazeale, but he didn’t take that fight either. Instead of facing those two, Whyte has been fighting Lucas ‘Big Daddy’ Browne, Joseph Parker, Dereck Chisora [x 2], Ivica Bacurin, Dave Allen, Robert Helenius and Malcolm Tann. Whyte didn’t take what some boxing fans believe to be the hardest fights against Ortiz and Breazeale. Whyte went for the softer road in fighting Chisora twice, Helenius, Allen, Tann, Bacurin, Browne and Parker. Whyte could have been Wilder’s WBC mandatory challenger a long time ago if he’d agreed to fight Breazeale or even Ortiz. Whyte has made his job much harder by not agreeing to take the fights that were there for him. It’s possible that Whyte believed that Hearn would eventually get him a fight against Wilder and/or Joshua without him needing to risk his neck against the talented contenders Breazeale and Ortiz. Whyte’s two fights with Chisora, and his match against Parker were all controversial due to the officiating. Whyte could have lost all three of those fights. There aren’t a lot of good heavyweight contenders for Hearn to match Whyte up with for a pay-per-view bout on Sky Box Office if he can’t negotiate the Joshua fight for him. Hearn mentions wanting to put together a fight between Whyte and #1 WBC Dominic Breazeale. However, Breazeale is in line for a title shot against the winner of the Wilder vs. Tyson Fury rematch. All Breazeale needs to do is wait for that fight to take place, and he’ll get the winner. It’s not worth it for Breazeale to fight Whyte next unless Hearn wants to overpay him. Hearn will try to get Breazeale to take the fight with Whyte, because if Dillian can win that fight, he would be the next in line to fight the Wilder-Fury 2 winner. Hearn will need to give Breazeale the same kind of money he would get in a title shot. “We’re in a position now where we’re going to have to strike,” Hearn said about him needing to make a decision soon about who Joshua will fight next on April 13 at Wembley Stadium in London, England. “There are three guys in play; Whyte, Tyson Fury and Jarrell Miller. Wilder’s not calling back. We’re not even getting a response. That’s even more frustrating than people think. If he would even come back to us, it would be nice. If [Oleksander] Usyk moves up to heavyweight, he should become the WBO mandatory, but obviously Dillian Whyte is #1. One of the issues is the split for the WBO mandatory is 80-20. It’s not a good split,” Hearn said. Hearn is mentioning Whyte, Fury and Miller as the big three that he’s picking from to choose Joshua’s next opponent, but most boxing fans believe that he’s already made his mind up and wants Jarrell ‘Big Baby’ to be the one that faces Joshua on April 13. Surely, the the rumored 70-30 split that Hearn has offered Whyte won’t be enough for him to agree to a fight with Joshua, and it’s possible that Hearn doesn’t really want him to accept the fight anyway. Miller, 30, is an easy money fight for Joshua, and he’ll make almost as much fighting Miller if not more. If Hearn gives Miller a small flat fee, then Joshua, Matchroom, Sky and the undercard fighters can take all the rest. It’s a good deal for Joshua to fight Miller if the idea is to focus on him getting easy money without worry of losing. If Hearn wants to do good by Whyte, he can give him the money that he’s asking for to fight Joshua. It’s unclear how much of a split Whyte wants for him to face Joshua, but it wouldn’t surprise boxing fans if he wants the same 60/40 split that Fury and Wilder are asking for. Hearn obviously isn’t going to tell the boxing media how much of a split that Whyte wants for him to sign for a fight against Joshua, but it wouldn’t be surprising at all if he wants 40 percent of the loot.